Like all schools, and like all Jewish Day Schools in particular, we at the MHA are interested not only in the academic learning of our students, but in the social, emotional, and behavioral learning of our students as well. As Rabbi Yisrael Salanter emphasized a century and a half ago, the gap between Jewish learning and Jewish behavior is too often too great, and we as Jewish educators have a responsibility to try and close that gap to the degree that we can. We therefore began reading up on PBIS (Positive Behavioral Interventions and Supports), an approach to behavioral learning that has gained quite a bit of momentum over the past few years and about which quite a bit of research has been done and published. As one of the central principles of PBIS is a school-wide focus on 3-5 positive desired behaviors, our admin team sat down at a meeting last year and asked ourselves what the 3-5 most elemental character traits that we'd like to see in each of our students might be. We came up with kindness, integrity, respect, and responsibility. Our next step was to share those four with our faculty and get their feedback. They were quite supportive. The challenge we ran into, though, was an acronym: KIRR, RIRK, or IRRK, didn't seem to work very well. 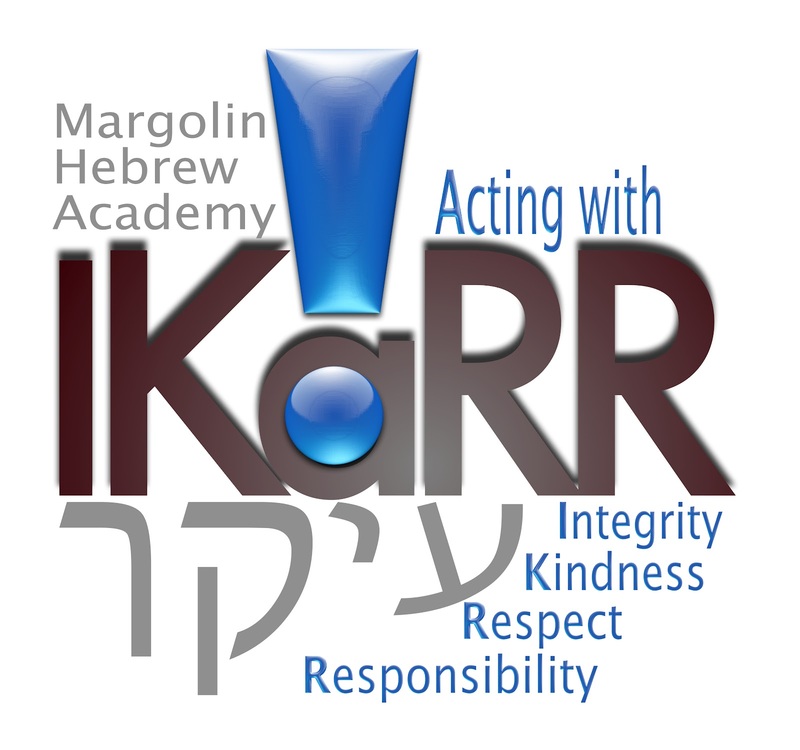 Over the summer, however, one of our teachers noted that with the inclusion of an "a" the letters of our four character traits fit a transliterated form of the Hebrew word "ikar" which means "the most important thing." Despite not quite knowing what to do with the "a," the power of that message - that these four traits comprise the most important thing - was too great to pass up. Therefore, we made the "a" small, and made our slogan "Acting (note the a!) with Integrity, Kindness, Respect, and Responsibility." 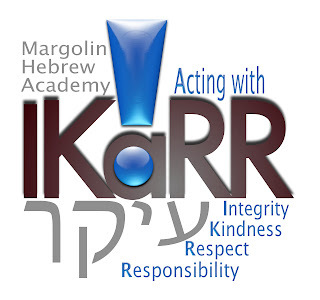 At this point, we are approaching the IKaRR initiative more as a school-wide awareness campaign than a full-blown PBIS system, simply because we have quite a few other things our faculty are working on at the moment and we felt that so much of the teaching around these values will arise organically from the material we teach simply by sensitizing ourselves and reminding ourselves of their centrality to our mission. To that end, we created a logo which students and teachers will see constantly throughout our building and which we hope will serve as that all-important reminder. We also have begun collecting quotations about these four values from Jewish and non-Jewish sources that are short, powerful, and to the point and have hung them throughout the school - together with some questions to provoke reflection - for students and faculty to see (yes, some are hanging in the teachers' room and are aimed at us adults, who are as much a part of this initiative as are the children). Here's a link to what we have put up to date. As we are a PreK-12 school, you will note that some are more geared to younger children, others to older students, and still others to our faculty and administrators. If you have quotes we can add to our list, please send them as we intend to change the signs throughout the year. We have a few other ideas for heightening awareness of these values that we'll unveil in the coming weeks. Here too, though, if you have ideas, please send them our way. We'd love to hear them!